Want to know more about your Android device? Smart System Info is here to help. Our latest Android application lets you find out all of the technical information about your Android tablet or smartphone. 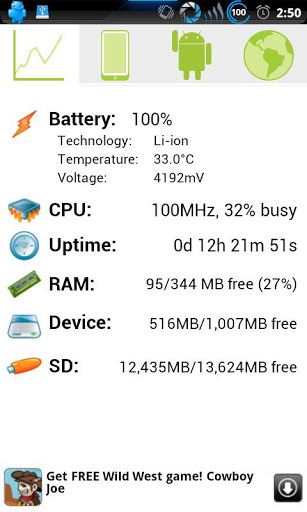 Smart System Info gives you a better insight into your device, with PPI, battery temperature, RAM usage, CPU usage and more. It has never been easier to find all of the advance specifications of your device, live and real-time. Smart System Info is elegant, minimalistic and simple – the beautiful user interface doesn’t stand between you and the information. Each section is split into 4 smart categories – for ease of access and fast switching. These categories are: usage, software information, device information and connectivity. Each tab is full of information such as uptime, model name and number, Android build, CPU usage and more – we are giving you more flexibility and information that any other free system application. 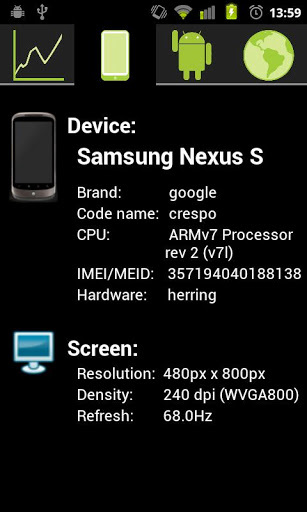 Smart System Info can be used with all popular Android smartphones and tablets – from Android version 2.1 and up. With our app, you can have all the system info that you will ever need at your fingertips. Be the master of your Android device with Smart System Info – system information, only a tap away.